Dozens of gun rights activists gathered in front of the Capitol Monday morning to voice their support for a bill that would end Texas’ 144-year ban on the open carry of handguns. 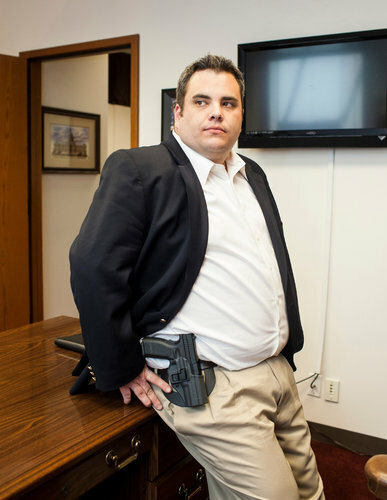 If passed, House Bill 195 by state Rep. Jonathan Stickland (R-Bedford) would allow gun-owners to carry their handguns in plain sight, and would also eliminate the requirement that a person obtain a concealed handgun license. Stickland told demonstrators at the event organized by Open Carry Texas that he was “sick and tired of begging for permission” to exercise his Second Amendment rights. Texas is one of six states that doesn’t allow open carry of handguns, although it does permit the open carry of long-guns and antique handguns made before 1899. Thirty-one states currently allow open carry without a permit and 13 require a permit. “What if it’s not with me when I need it?” she asked. Sterling Lands, a bishop with Family Life International Fellowship in Austin and the lone black face in the crowd of demonstrators, had a reason for supporting open carry that wasn’t articulated by the speakers. He believes that restrictive gun laws in Texas were created as a response to the Emancipation Proclamation and the end of the Civil War, and that current gun laws are discriminatory. “The idea was to make certain that blacks were never able to rise up in any type of an armed revolt,” Lands said. He supports HB 195, because he worries that current regulations discriminate against those who cannot afford the $140 concealed handgun license, and those who aren’t able to complete the written test required to obtain the license. Stickland and Open Carry members support “constitutional carry,” asserting that most regulations on gun ownership are unconstitutional. According to CJ Grisham, the founder of Open Carry Texas, this hasn’t been an effective argument. He advised activists who planned to speak to their representatives after the rally not to “bring up the constitutional right thing” when speaking with representatives. Grisham encouraged activists to stress that open carry can deter crime. “An armed society is a polite society,” he said, echoing a common NRA refrain. Open carry supporters haven’t always followed their own advice. On Jan. 13, Open Carry Tarrant County stormed the office of Rep. Poncho Nevárez (D-Eagle Pass), calling Nevarez a “tyrant to the constitution.” The confrontation prompted lawmakers to pass a rule allowing the installation of panic buttons in Capitol offices. “Show them that we’re a very professional organization and we’re serious and committed to trying to get this legislation passed,” Grisham said.